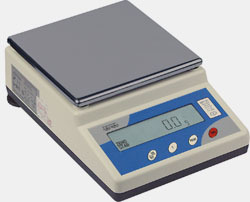 Balances of WPT series use tensomertical conveter as measure element. Balances with this kind of build are perfect device to fast and precise measure mass. Undeniable advantage of these balances is simplicity of service what with low price is atractive offer on polish market. Every standard balance is equiped with socket RS 232 with changeable transmission of parameters and possibility of continuous transmission. Balance WPT 3/6C is two ranges balance. Max resolution of balances of WPT series is 30 000 reading divisions.